We must have the courage to push back against intellectual dishonesty – Did You Check First? 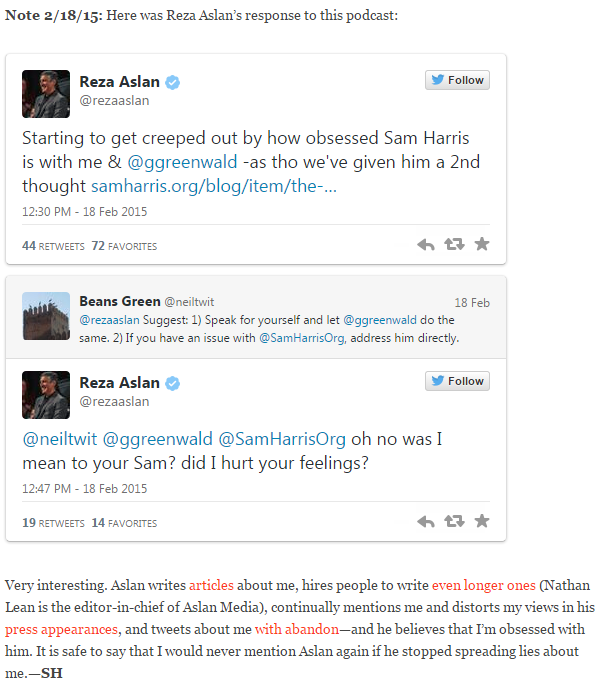 Reza Aslan and Glenn Greenwald are playing the O’Reilly “Tiller-the-baby-killer” card against Sam Harris. They are being intellectually dishonest about the role that religious fundamentalism plays in the violence and intolerance the world over. They are providing cover to others to do the same. In this writer’s opinion, everyone who perpetuates these sorts of lies and obfuscations are as culpable as O’Reilly was in his role in the murder of Dr. Tiller. Here’s what makes this more disturbing. O’Reilly’s not a an actual journalist. Just ask him. He’ll tell you. Aslan and Greenwald are supposed to be journalists. That’s what makes Aslan’s and Greenwald’s behavior and their actions even more confounding, more mystifying, and far, far worse than anything the overpaid, uninformed, empty-suited, Fox mouthpiece says or does. No one of any seriousness takes O’Reilly seriously. Aslan and Greenwald are supposed to be different. Not so long ago, I admired and respected Greenwald. Hell, it was Glenn Greenwald who got invited by Laura Poitras to fly to Hong Kong to interview Ed Snowden. The two of them are editors now at The Intercept, a publication I read and respect. I think…. Greenwald’s intellectual dishonesty when it comes to Harris is just so bewildering. I can only conclude that he, Aslan, and all of Harris’s detractors choose either not to understand the points being made my Harris, or simply don’t have the intellectual capacity to understand them. That’s not an insult. I don’t understand modernist art or astrophysics. It doesn’t make me stupid, inferior, or a bad person. It just means that I don’t understand the subjects well enough to have a well-informed opinion about them. I thought Aslan and Greenwald were smart enough to understand the connections between fundamentalism, intolerance, and violence. I can only conclude, therefore, that they are consciously choosing to obfuscate and lie about it. Now, before anyone is tempted to respond to this post in their defense, I hope you’ll take the time to listen to Sam’s podcast. Listen to all of it. Even better, read Harris’s books. There simply are no reasonable, rational, or logical corollaries that can be drawn that put atheism on an even par with religious extremism. None. Zero. So, in my view, anyone who continues to perpetuate the sorts of lies that Aslan and Greenwald are perpetuating is only increasing our inability to openly and honestly talk about the risks to people’s lives and to the future of a civil society that comes from violent jihadism and religious fanaticism of every stripe. It’s up to all of us to push back against this sort of intellectual dishonesty. The first step in solving a problem is to admit you have one. Religion has a problem. It’s called extremism. Atheism has no such problem. Atheist doctrine does not call for the murder of the believer or of the sinner. Only religions do that. This is the level of maturity and seriousness Reza Aslan is giving to this. Pingback: We must have the courage to push back against intellectual dishonesty | Did You Check First?